“Saute mushrooms and onions in butter. 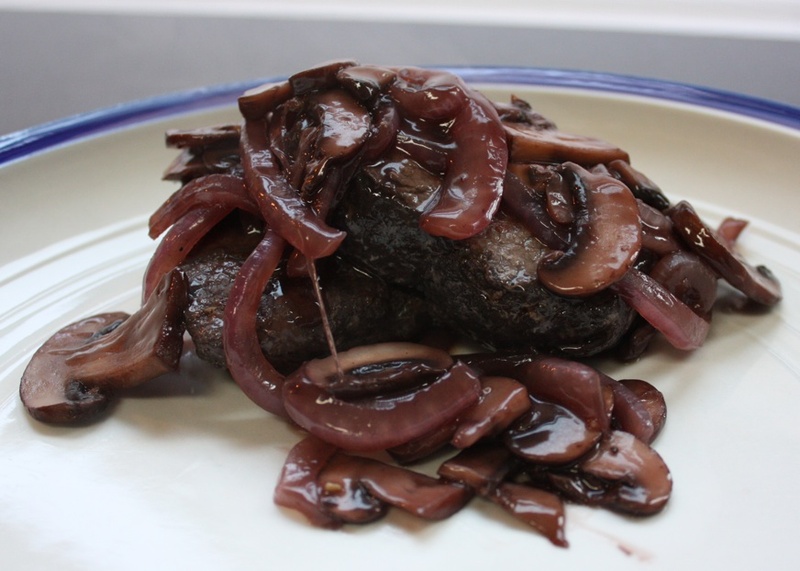 Dissolve cornstarch in water and add to mushrooms and onions along with remaining ingredients. Simmer until mixture thickens. 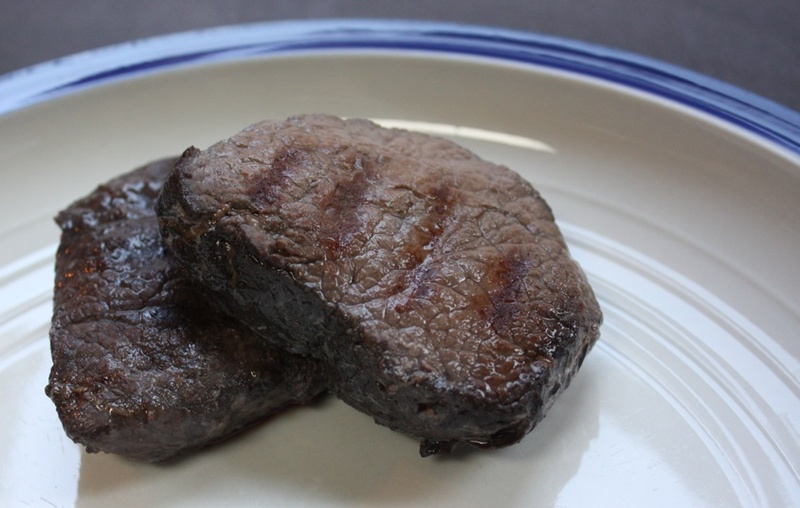 Serve warm over venison steaks. Makes 4 servings. Notes: Thanks Kent! Chris and I enjoyed this recipe and will definitely be making it again. Jen made these really tasty shrimp spring rolls with sesame ginger dipping sauce. I tasted them. Several of them. Delicious. 1/2 cup Dipping Sauce- I used Newman’s Own, low fat Sesame Ginger Dressing-delicious! I used 8″ square rice paper (I picked it up at the Asian Food Market on Belmont). Soak the rice paper in water for about 30 seconds-until it becomes flexible, drain off excess water and lay flat on working surface (I used a baking pan filled with warm water to make sure the entire square could soak). Along one end of the rice paper, arrange in a line, 1 tablespoon of cilantro and 2 tablespoons each of: bean sprouts, carrots and shrimp (more or less depending on your tastes or desired roll size). 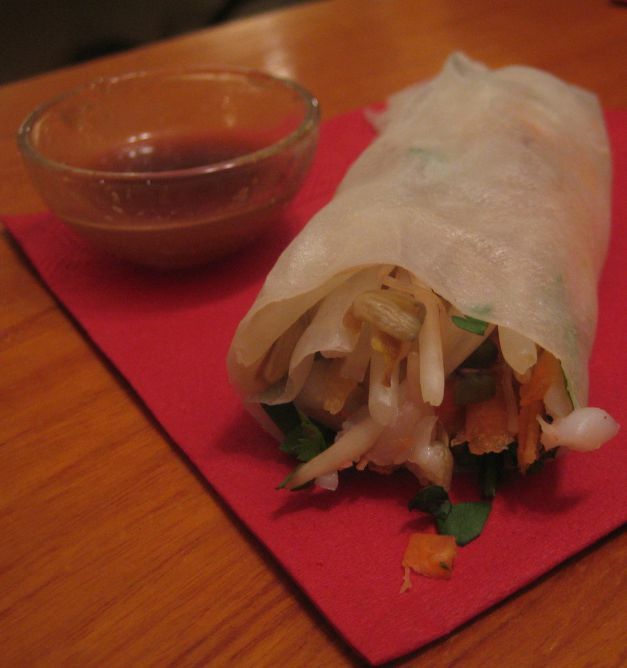 Starting at the ingredients end, roll the rice paper as tight as you can and put aside to set up. Repeat until you run out of ingredients. Cut each roll into halves or thirds. Arrange on a plate and serve with dipping sauce. Makes about 6-8 whole rolls. You could use any number of vegetables in this same manner as well as cooked chicken or tofu instead of shrimp. So easy, fast and healthy! Notes: I had to experiment a little to get the amount of time the rice paper soaked correct. You need to have it be flexible enough to roll, but if you soak it too long it becomes gooey and rips apart. One good thing to remember is that the rice paper will continue to soften after you remove it from the water. Warm water seems to work better and faster than cold, but either will work. Also, these are best if made as soon as possible before serving. If they sit too long the rice paper will become gummy or if sitting for way too long they will dry out. Neither of which is very appealing. 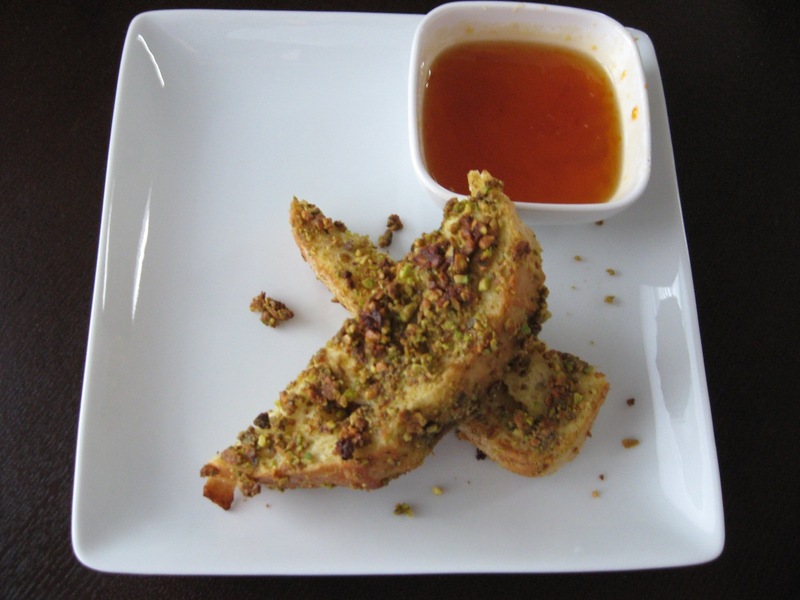 Shea made this beautifully presented pistachio-crusted vanilla French toast with an apricot maple syrup. She followed this recipe. Shea said “I followed the recipe almost exactly using a thick white Italian loaf of bread from the bakery. I did substitute a dash of cinnamon for the nutmeg, as I had no nutmeg on hand. This made a ton- next time I will prepare it for lots of company rather than just Nick and I.
Preheat the oven to 350° F. Butter one or two baking dishes large enough to accommodate the bread in one layer. In a large, wide bowl, whisk together the eggs, milk, sugar, vanilla, nutmeg, and salt. Heat a large, heavy, nonstick skillet over medium-high heat. One by one, dip the bread into the egg mixture, turning it and making sure it is completely saturated. Carefully dip the slices into the ground pistachios, coating them evenly on both sides. Add the butter to the hot pan and swirl the pan. When the butter foams, carefully transfer as many pistachio-coated slices as will fit in the pan without crowding. Brown on each side, about 2 minutes per side, and transfer to the baking dish. Place the baking dish in the oven and bake 15 minutes.